Industrialization created cities of Dickensian squalor that were crowded, smoky, dirty, and disease-ridden. By the beginning of the twentieth century, urban visionaries were looking for ways to improve living and working conditions in industrial cities. 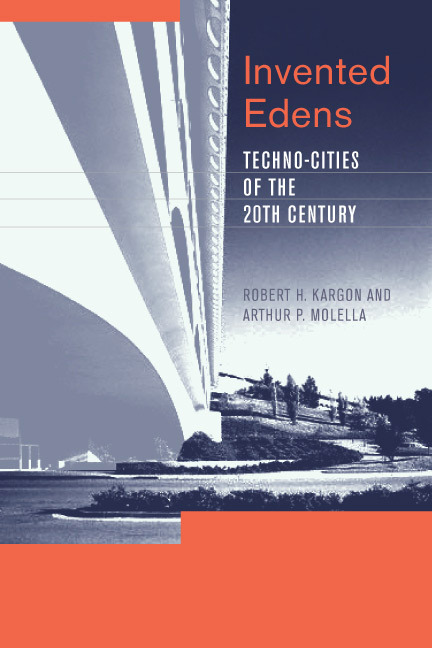 In Invented Edens, Robert Kargon and Arthur Molella trace the arc of one form of urban design, which they term the techno-city: a planned city developed in conjunction with large industrial or technological enterprises, blending the technological and the pastoral, the mill town and the garden city. Techno-cities of the twentieth century range from factory towns in Mussolini's Italy to the Disney creation of Celebration, Florida. Kargon and Molella show that the techno-city represents an experiment in integrating modern technology into the world of ideal life. Techno-cities mirror society's understanding of current technologies and, at the same time, seek to regain the lost virtues of the edenic pre-industrial village. The idea of the techno-city transcended ideologies, crossed national borders, and spanned the entire twentieth century. Kargon and Molella map the concept through a series of exemplars. These include Norris, Tennessee, home to the Tennessee Valley Authority; Torviscosa, Italy, built by Italy's Fascist government to accommodate synthetic textile manufacturing (and featured in an early short by Michelangelo Antonioni); Ciudad Guayana, Venezuela, planned by a team from MIT and Harvard; and, finally, Disney's Celebration—perhaps the ultimate techno-city, a fantasy city reflecting an era in which virtual experiences are rapidly replacing actual ones. Robert H. Kargon is Willis K. Shepard Professor of the History of Science at The Johns Hopkins University. Arthur P. Molella is Jerome and Dorothy Lemelson Director of the Smithsonian Institution¹s Lemelson Center.